I have received many responses to my article "Details, details". Some of these have offered arguments for why the ura zuki (inverted knife hand strike) should be 45 degrees relative to the front rather than point straight forward. Essentially these arguments attempt to prove that the nukite should follow the angle of the shiko (ie. the red arrow in the adjacent picture) rather than follow the angle of your front knee (which points straight forward - ie. the green arrow). The first reason given is that the nukite could be used to a vulnerable region on the face once the head is pulled down; the region might only be accessible by a “sideways” angle. This can work, but as with the gojukensha saifa, I think this is creating a different beast - or perhaps just making the best of a poor body structure! 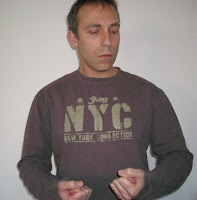 Furthermore, in my opinion the primary application does not involve a head grab; the "sukui uke" (scooping deflection) is a technique designed for wrist/forearm grabs. I make this observation based on the small "rolling wrist" structure of the deflection and many years of using sukui uke in free-sparring. Accordingly the head grab option is for me, at best, an "oyo" (extrapolation). It cannot justify the performance of the kata with a weak angle. Other colleagues have suggested that when you move to the outside of your opponent, you should use tenshin (body evasion) which will take take you more off the angle of attack, leading to a greater angle in your nukite. The angle at which you go defend and the angle at which you counter are 2 different things. Assume you evaded by moving sideways. I would still expect you to turn to your opponent as you're countering so that your nukite and your front knee both point at the target. In other words, however you evade, you should respond by moving optimally into your attack. Shiko just isn't designed for sideways type moving. It is designed for this kind of "45 degree" movement relative to your opponent - ie. your shiko is at 45 degrees facing your opponent as you counter attack. You can get into that position from wherever you are after evasion. In my opinion here is simply no reason to move into your counter attack in a sideways shiko dachi (and have to deal with the contextual unsuitability of such movement and the fact that your inverted knife hand is blocked off by your body). To summarise, the angle of evasion does not equal the angle of counter attack. As a rule you don't want to fight sideways (I know some sports stylists will disagree, but I feel this is a fundamental point). There are situations where you are unavoidably in a side-on position (the saifa situation above is a good example). However I contend that there is nothing in this seiyunchin move that requires you to adopt a side-on posture (in shiko dachi, of all stances!). And, head grabs aside, I can't see why your strike would have to be angled in line with your shiko unless you were fighting sideways. 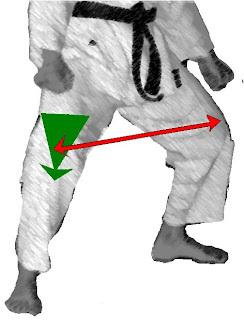 Now I believe that some karateka have erroneously looked at the kata suparinpei and noted that the ura zuki in that kata (performed in sanchin) is not aimed forward, but rather is angled at 45 degrees to the front. They have then similarly angled their nukite in seiyunchin. I happen to think the angle in suparinpei's nukite is correct. How do I reconcile this with my stand on the same technique in seiyunchin? The answer is simple; in both kata your forearm should be 45 degrees to your body. This is it's natural position and accordingly its "power" position. If you doubt me: have your arms at your sides and bend your elbows so that your forearms raise to a horizontal position in a natural way. You'll note that your arms naturally position themselves at a 45 degree angle relative to your body. The reason that the nukite in seiyunchin should end up facing forward while nukite in suparinpei does not is this: in seiyunchin you are in shiko with your body angled 45 degrees to the front. The further 45 degree angle in your forearm means that your nukite will be 90 degrees to your opponent who is directly in front of you (remember that 45 + 45 = 90). In suparinpei you are in sanchin facing straight forward. Your nukite is thus going to go off at a 45 degree angle relative to the front. This is not a problem, as you will observe in the video below; because you are in sanchin you can and should get in much closer to your opponent on your counter, negating any of the issues that might arise with the seiyunchin nukite. Accordingly in my view it is erroneous to assume that just because your nukite in suparinpei does not point forward you should make your seiyunchin nukite do the same. Rather you should use your own body as a cue. The golden rule is keep your inverted strikes at 45 degrees to your body. If you do this, your strike will be in its optimum striking position. 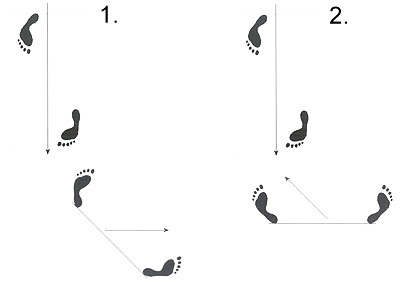 Whether an ura nukite points straight forward or not in a kata is merely a function of the angle of the stance you happen to be in at the time. You're right about the seiyunchin nukite. Otherwise your body would have to switch to zenkutsu dachi to maitain a proper balance. I can see in terms of bunkai how one would make the necessary adjustments. The danger for kata practice would be the "unrooting" of your position. A lot of these dudes start "bunkaing" their kata too much in their quest for the "real." In their quest, they unravel the kata until there is nothing left but their improvisations.A kata is always a compromise, it can't cover all eventualities and contingencies. It's an ideal. a model. It is not a bunkai. Thanks for your support Jorge. I have the feeling this one is a bit controversial, but I really don't think it should be. You're spot on about the "bunkaing". Kata is primarily about teaching your body a particular kinaesthetic awareness. This precedes any bunkai. The "controversy" lies in the present uproar on the relevance of katas and forms; all the saliva whirling about as to what martial arts is or was or should be. In this context, all dialogue becomes debate, and all debate becomes rant. This, unfortunately, has become endemic to the Internet. Funny, when one sees Gracie in his drills he seems as systemic as a Buddhist monk. Wonder why.